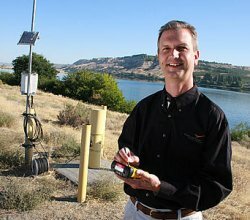 PNNL hydrologist Tim Scheibe is the 2010 Henry Darcy Distinguished Lecturer in Ground Water Science. Scheibe is currently working on simulating flow, transport and biogeochemical processes in the Hanford Site subsurface related to contaminant transport in groundwater systems. Dr. Timothy D. (Tim) Scheibe has been selected as the 2010 Henry Darcy Distinguished Lecturer in Ground Water Science. Scheibe, a staff scientist at Pacific Northwest National Laboratory, was invited by the National Ground Water Research and Educational Foundation to spend next year lecturing at colleges and universities to educate and create interest in groundwater science and technology. Quantifying Flow and Reactive Transport in the Heterogeneous Subsurface Environment: From Pores to Porous Media and Facies to Aquifers. Since joining PNNL in 1992, Scheibe's research has focused on characterizing and modeling natural subsurface heterogeneity and its impacts on contaminant transport in groundwater systems. Recently, he worked on subsurface biogeochemistry problems, including microbial transport in groundwater and bioremediation of metals and radionuclides. Scheibe is currently working on simulations of coupled flow, transport, and biogeochemical processes. Most of his research has been for the U.S. Department of Energy's Environmental Remediation Sciences Program and its Scientific Discovery through Advanced Computing (SciDAC) program. The Darcy Lecture Series was established in 1986 in honor of Henry Darcy, a French engineer whose investigations established the physical basis on which groundwater hydrogeology has been studied since 1856. The National Ground Water Association is a nonprofit organization of more than 13,000 U.S. and international groundwater professionals.